Techtextil, the leading international trade fair for technical textiles and nonwovens, will open its doors in Frankfurt, Germany, from 4 to 7 May 2015. Besides countless other applications of these products in the context of industrial manufacturing processes, applications for architectural use are only one aspect – but an obviously very attractive one. Some exhibitors’ exemplary reference projects already indicate the sector's enormous range and capability. And it’s in the nature of things that, when it comes to textile architecture, it’s almost invariably a matter of highly customised solutions – sometimes the material itself, but always its specific application. Here at least, architects and manufacturers sing from the same hymn sheet, so to speak. The customer focus even extends a whole step further, because as of an order quantity of around 5,000 square metres, textiles and their coatings are modified or redesigned to suit the specific project. By nature, complex, wide roof structures are more challenging than puristic flat guyed facade solutions. Again, the technical and aesthetic requirements are high and the user has, in a facade, both the textile fabric itself and the constructional details almost right before their eyes. This is the case, for example, at the Fritz Lipmann Institute in Jena, Germany. 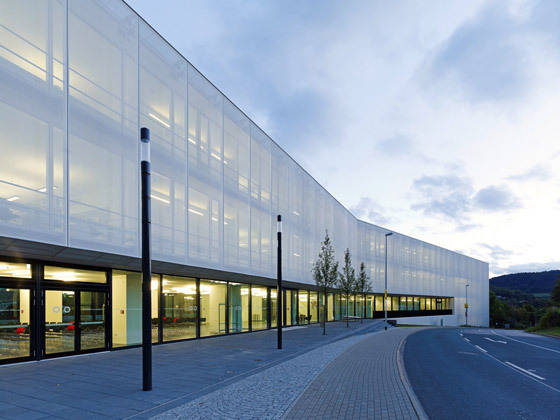 The building, completed by Erfurt-based hks | architekten in 2013, was given a roughly 3,800-square-metre coated textile fabric facade made from a PTFE fibreglass mesh fabric with A2 classification. This ‘skin’ makes the three- to five-storey building massing of the institute appear to almost float, amplifying the appearance of high precision. The building envelope also acts to prevent people from being able to peek inside while still enjoying the full benefit of daylight. Moreover, products from the Duraskin® range are characterised by high UV and weather resistance, high stain resistance, as well as a service life of at least 30 years. One thing is certain: when it comes to building with textiles around the world, there are more architects than companies who can implement their designs. And if it’s a matter of bringing to a successful conclusion a half-finished football stadium under high time pressure in some distant part of the world far from their office, that number shrinks significantly. 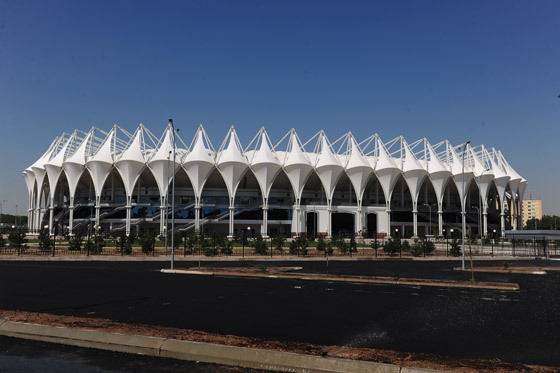 The Sattler subsidiary Ceno Tec GmbH from Greven accepted such a challenge along with Saalfeld-based steel fabricators Oberhofer from Austria, and, in 2012, built within eight months and no architect whatsoever the Bunyodkor football stadium in Uzbekistan. 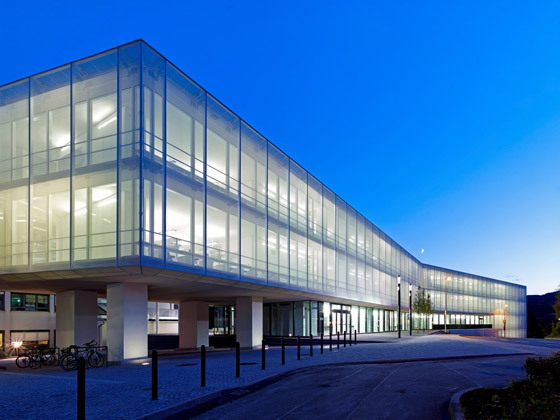 Besides a textile roof area of 30,000 square metres, about 10,000 square metres of textile facade made of PVC-coated polyester fabric (type III) was also realised. 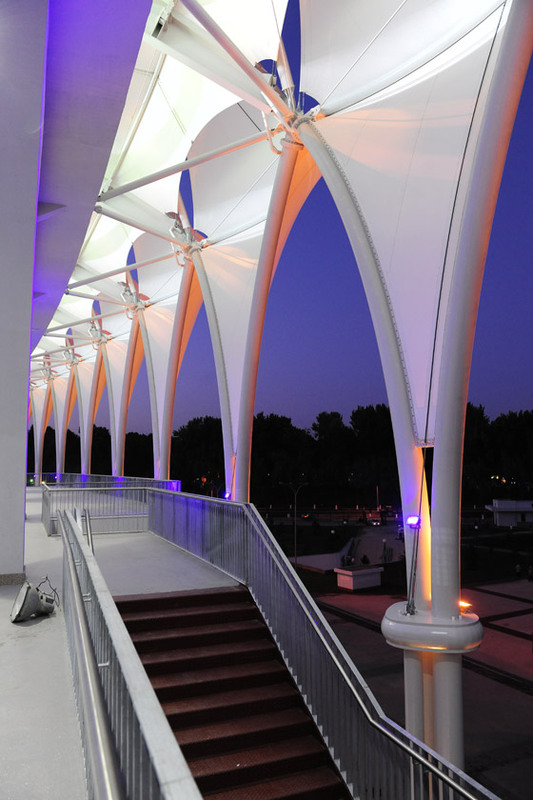 An ambitious project, consisting of design, structural analysis, manufacture and installation. Locally, there was a circle of foundations and the upper edge of the concrete of the grandstand bowl with attachment points acting as anchor and fixing points. The Ceno team, responsible for the supporting structure and membrane along with all the details, worked in perfect harmony with the steelworkers. ‘The responsibility for dimensions and the fit lay entirely in our hands. As we were able to adapt the fixing points on the Uzbek shell a little, the precisely prefabricated elements were easy to mount well. The CAD planning level was identical for the steelworkers and us, the membrane manufacturer, who also have to supply the secondary steel. This leads to dimensional tolerances comparable to those in mechanical engineering,’ Wolfgang Rudorf-Witrin, Managing Director of Ceno Tec GmbH, says, not without pride. He is also satisfied with the end result – just as satisfied as the client. The visual presence of the 35,000-seater stadium is enormous. In the meantime, the 64 backlit facade sails protectively surrounding the arena have come to be regarded as the ‘Flames of the Orient’. With a height of 34 metres, they also form, at the same time, a dynamically expressive and invitingly open series of pointed arches nearly 640 metres in length. An additional challenge of this project lay in the sphere of logistics, because the lorries with 3,700 tons of steel, the membrane panels, a few kilometres of rope and edge fastenings and so on didn't reach their destination in the order in which they set off. This meant that, for reasons of time, assembly had to start at different points of the site simultaneously. Making a facade constructed of metal mesh not appear like medieval chain mail but as a visually light and enveloping cocoon is quite an accomplishment. 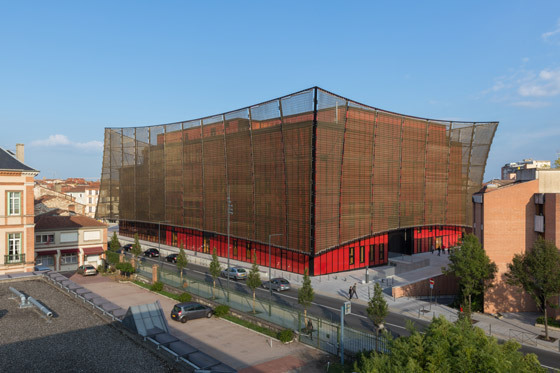 This is what has been very impressively achieved with the construction of the Grand Théâtre des Cordeliers in Albi, France. Technical weaver GKD – Gebr. Kufferath AG from Düren – achieved a masterstroke in several ways when it realised the sophisticated design of star architect Dominique Perrault. The aim was to optimally integrate the cubic volume of the theatre in the surrounding area on the outskirts of the historic city. 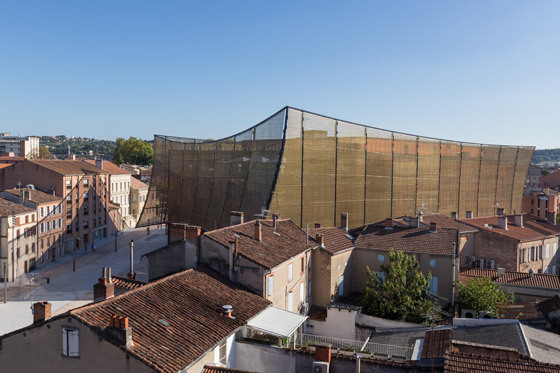 The semi-transparent and shimmering gold wrap developed for the purpose quickly turned into a new town landmark, but numerous hurdles had to be overcome until it was completed. The architect, for example, wanted opposing curvatures and different heights, which led to the customisation of the aluminium spiral mesh, type Escale, with a spacing of 150 x 20 millimetres. Each of the nearly 5,000 spirals had to be produced in customised lengths and assembled into panels, creating 36 vertical panels or fabric strips of customised lengths and without any right angle. They were then used to compose the 4,800-square-metre large and spatially curved veil, which avoids the pure perpendicular, especially at the corners of the building, sags slightly in the upper horizontal completion of each side, and, at the bottom, develops opposing gentle curves. This all resulted in the creation of a very ‘exciting’ structure, one that veils the cube-shaped building inside. That would have been impossible without any additional lateral bracing, absorbing the forces generated by almost invisible stainless steel cables that were specially drawn into the aluminium mesh.